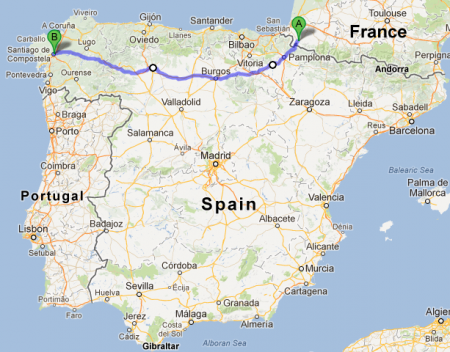 In May 2013, Kathey and I will be doing the Camino de Santiago, which is a walking route across northern Spain. The most popular route is 500 miles (800 km) and takes about 40 days, walking 12-15 miles (19-24 km) per day. It starts in a little town just on the French side of the border and ends in Santiago de Compostela, near the west coast of Spain. We’re going to do the first 11 days of it and see how far we get. The Camino de Santiago (or “Way of St. James” in English) is a pilgrimage to a cathedral in northwest Spain where the apostle Saint James is buried. The route dates back to the 9th century, and has been continually active ever since. The number of people doing it each year has varied, but it’s been steadily rising over the past few decades. In 1985 there were only 690 people, and last year there were almost 200,000 people that did some part of it. You get a “Camino passport” when you start, and then you get it stamped at each hotel or hostel you stay in along the way. If you make it all the way to the cathedral in Santiago de Compostela, you get an official document (the “Compostela”) in Spanish or Latin saying you completed the Camino. I found out about the Camino when I watched a movie several months ago called “The Way” with Martin Sheen and Emilio Estevez. I’ve been thinking about it ever since. When we discovered that some people do the Camino in segments each year rather than all in one 40 day trip, we realized we could take a couple of weeks and see how far we could get. If our two week adventure goes well, we may go back another year and finish the route, picking up from wherever we leave off this time. We have our plane tickets and our new backpacks, and have started working our way through the list of a million-and-one things that need to be done before we leave on May 18th. 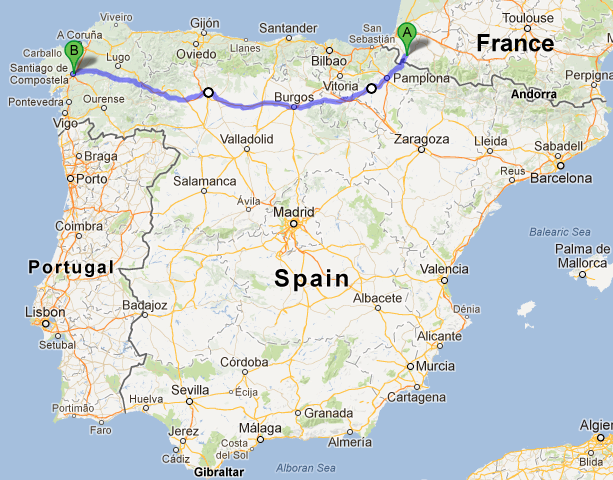 In some ways, this trip seems almost as complicated to plan as our 9-month trip was in 1991, but in different ways. We’re doing a lot of training for this trip, because we’ll be walking the equivalent of a half marathon every day, with backpacks. Every bit of weight we add to the packs is something we have to carry for 11 days. We’ll be updating this blog as we progress through the to-do list, and we’ll try to upload photos and videos of the beautiful Spanish countryside after we get started in May. Watch this space! If you want to find out more about the Camino de Santiago, you can read the Wikipedia entry or watch the movie “The Way” that I mentioned above. The movie is available for internet streaming on Amazon, iTunes, Google Play, PlayStation, and Vudu. How exactly do you train for this? Are you just wearing a backpack and hiking? I’m excited for you both- I’ll feel like I’m along for the ride! Best of luck to you both. Sounds like you will be well prepared. Looking forward to reading about your adventure. We head out Sept 2014 to celebrate our 35th year of marriage. Up to 20-30 mi/week here in the Ozarks… Hills are killers! Really excited to follow you as you make your journey. I watched the movie and thought about how cool it would be to make the walk. I will do that vicariously with you. You mentioned you blogged each day – I would rather do that than diarise by hand. I guess a small tablet is the way to go …. what do you recommend? By the way am loving reading about your travels and advice/info – tis invaluable. My husband and I are doing this in Sepember -October this year. We are so excited. You could go with a tablet, but I wouldn’t take anything larger than a 7″ tablet or an iPad Mini. You’ll still be typing on a glass keyboard, and being able to see the text and photos on a larger screen is nice, but not really very necessary. Taking a USB keyboard and mouse would make things easier, but again, you’re back to the weight problem. I wrote all my blog posts with my index finger and got used to it pretty quickly. If you do go with a tablet, think about which device you’ll be taking photos with, and how you’ll get the photos uploaded to the blog. If you take the photos with the tablet itself, make sure you can carry it in a pocket and access it quickly. Since we wanted to carry a phone also, it didn’t make much sense to take a tablet as well. But if you’ve already decided not to take a phone, or if you can put a Spain SIM card in the tablet and make the odd local (or emergency) phone call with it, then a tablet might work just as well for you. As much as I loved doing the blog each night, it did take up a lot of time, and I often found myself hurrying to finish a post before they turned the lights out. That’s time in the evening that I could have been exploring the town, or just laying in bed relaxing or reading a book. I’ve already decided that next time, I’ll still post photos, but I’ll try to write less text and get the post finished earlier each night. So my advice is to take as few devices as possible, with as little weight as possible, and don’t worry about whether it’ll be frustrating dealing with a small screen. As long as you can upload photos and write a couple of paragraphs of text, it’s probably all you need. Good luck on your trip, and Buen Camino!